In the Great War Bramwell Harry Bonning (1899-1975) joined the Leicestershire Regiment in 1916 and transferred to the Manchester Regiment in 1918: he was discharged in January 1919. He performed various roles in WW2 including membership of "C" Coy. 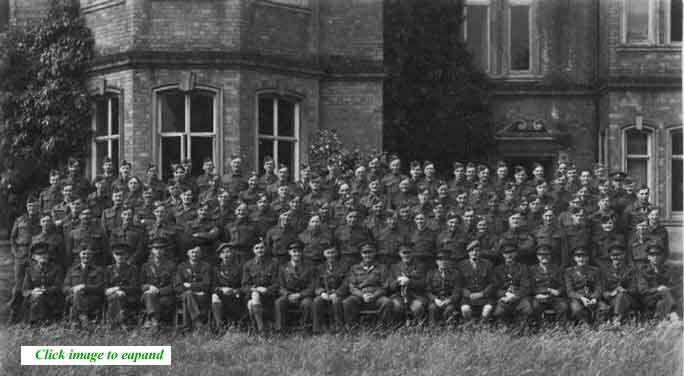 of the 9th North Riding (Middlesborough) Battalion of the Home Guard - NR9, commanded by Lt.-Col. Crawford - in a unit which was based in Sheriff Hutton. Contemporary documentation confirms his rank as Lieutenant but he was later promoted to Captain. Later in the war he moved to Leicestershire where he was in the ARP and afterwards was a member of the Royal Observer Corps for a number of years. 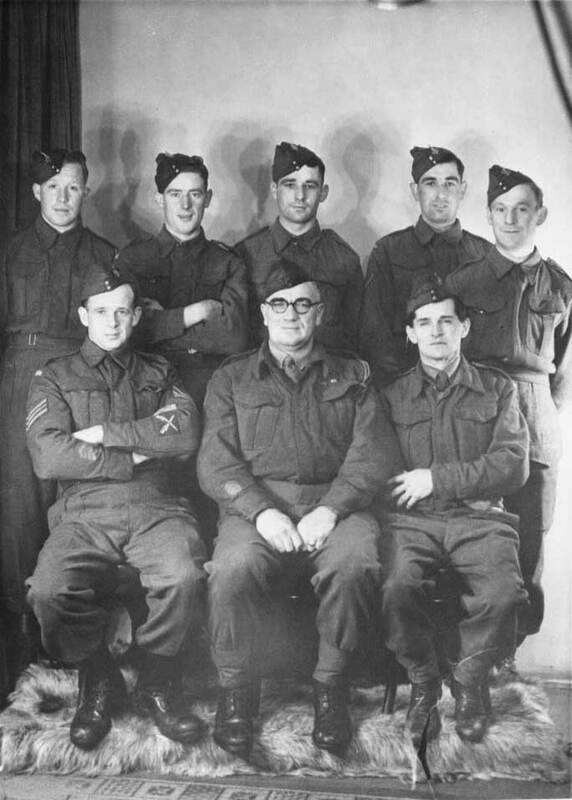 Several documents and images relating to his Home Guard service in the North Riding have survived within his family and are reproduced below. Research into his Home Guard history continues and any information concerning him or his unit would be welcomed. 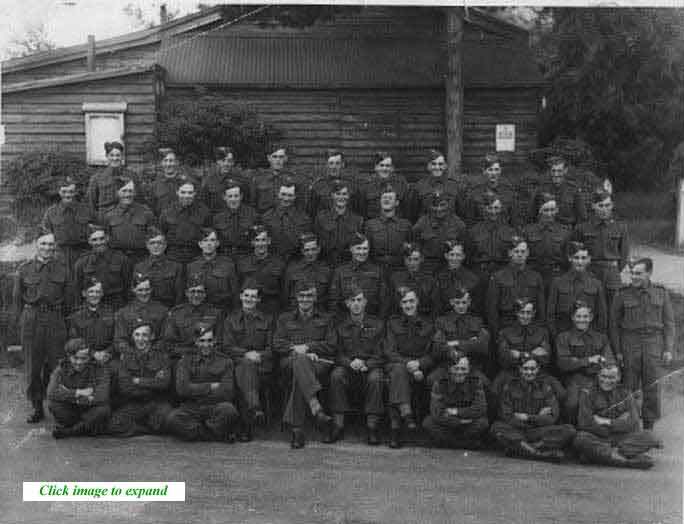 We can follow his steps and see him reappear in the following photograph, taken far from the North Riding, where he is seated in the second row back, extreme right. 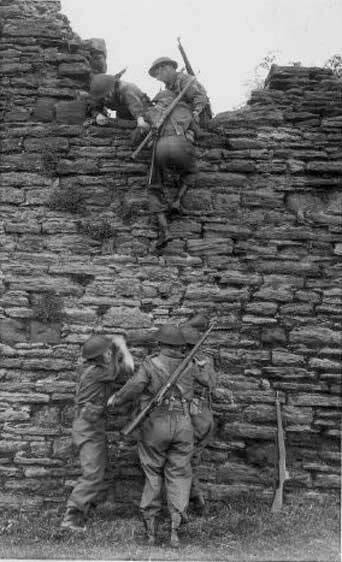 This is a particularly interesting photograph as it includes men from many different Battalions. Some of these invidividuals are named (see below). 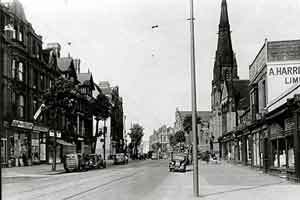 The photo is accredited to Taylors Press Service of 366 Soho Road, Handsworth, Birmingham 21 and this provides the essential clue which tells us where Harry Bonning has gone and why. 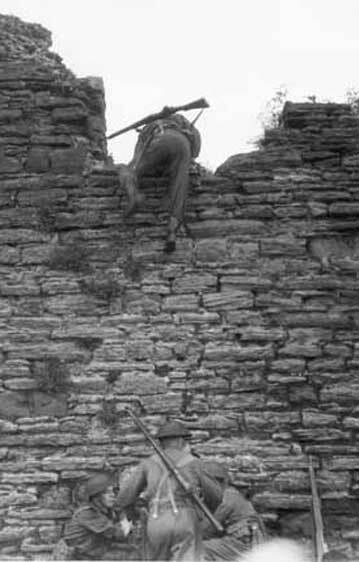 The event i s a Home Guard training course. He and a large number of his comrades are attending the Birmingham Street Fighting School, officially known as GHQ Town Fighting Wing, located at 130 Bristol Street, a main thoroughfare to the south-west of the city centre. The men will probably be accommodated at the Blind Institute, not far away in Carpenter Road. Tuition will take place at both venues. There is evidence of Luftwaffe attention in the photograph and it is certain that some practical training takes place in nearby bomb-damaged streets. (See a separate page in this website which provides more information about the courses at this School). 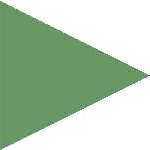 The precise location of the image is known. "130 Bristol Street", the home of the Town Fighting Wing, is revealed to be a large, probably disused church and adjoining Sunday School. 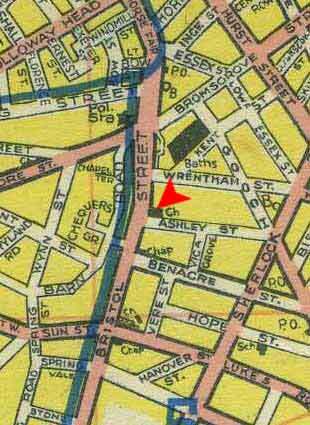 These buildings are located on a site at the corner of Bristol/Ashley Street and known as The Old Meeting Church. 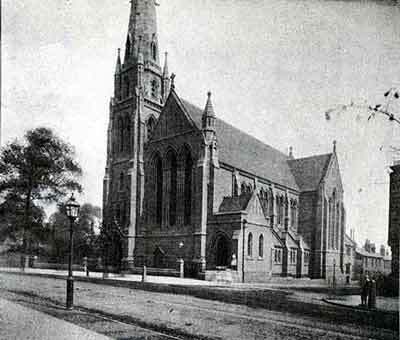 The church can be seen on the right hand side of Bristol Street in the image to the right; and below, in a view from the early 20th century. It is a Unitarian church, built in 1885 and containing Burn-Jones stained glass windows. As can be seen it is an imposing and impressive building; its destiny will be to survive the Birmingham Blitz and the ravages of Home Guard students, but not the post-war city planners. 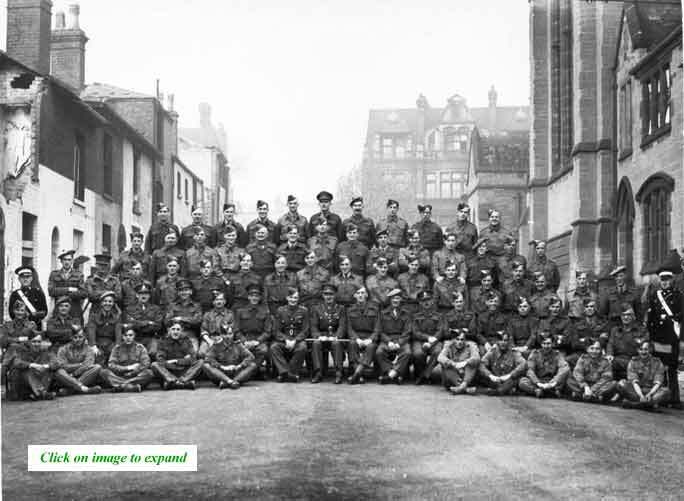 The Home Guard group is arranged at the side of the church, facing away from the main thoroughfare and down Ashley Street with its rows of terraced houses. Behind the group, in the distance, the large building to the right is on the other side of Bristol Street. 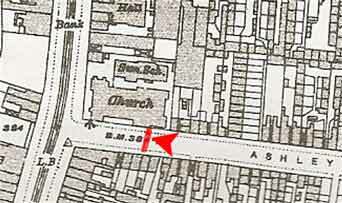 The 1913 map below shows the exact location of the group. By the time that Harry Bonning is there, many gaps will have appeared on the map following the major air raids of 1940 and 1941. But otherwise it depicts the area precisely as he sees it and how it will remain for many years after the war. Eventually as time passes the entire area will be re-developed beyond all recognition. Everything will be swept away and nothing will remain of these buildings, nor of Ashley Street itself, other than memories such as this. "Lieut. J H Wylie Edinburgh; 2/Lieut. J H Davis 8ER Hull; 2/Lieut. Farquhar Beaton 3 ABK; 2/Lieut. W S Chalmers 3rd Aberdeen & Kincardenshire; 2/Lieut. W Nicholson 12th DHM; Lieut. Bull (?S G) 18th Batt. Warwicks (Coventry) HG; Lieut. J W Cooper 7th Batt Shropshire (Wellington) HG; R Gates 6th Batt Leicester HG; J E Ward 3rd Batt HG; Lieut. H Probert 3 ?KT Bn Warwicks; 2/Lieut. J W Wills 42nd County of Lancs. ; Lieut. A Andrews 7th Glasgow HG"
The Sheriff Hutton unit to which Harry Bonning belonged - "C" Coy. 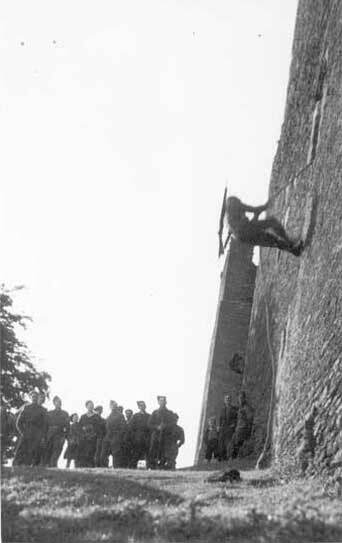 of the Battalion - was clearly adept at demonstrations and training exercises. 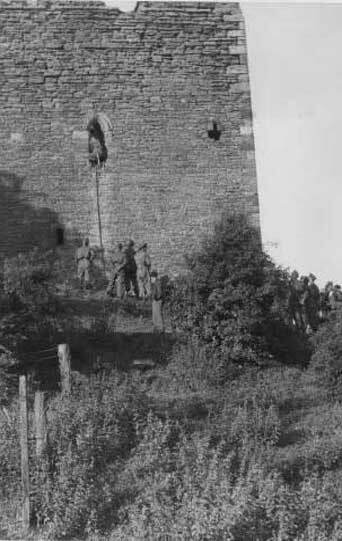 Photographs survive of these ambitious activities and it seems that the nearby 14th century castle was a popular venue. 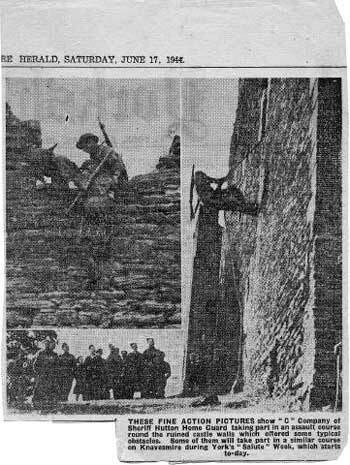 The event illustrated below took place in June 1944. The above event was well covered in the local press. 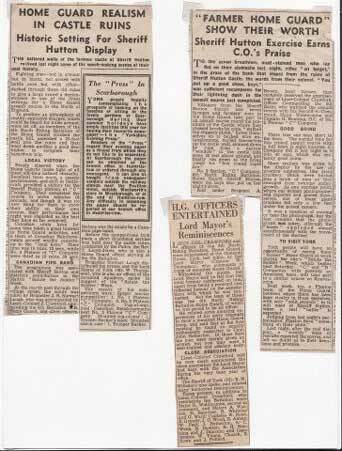 One of the above cuttings includes a report on a dinner held by the Lord Mayor of York, the C.O. of a mounted Home Guard unit, in honour of the 9th North Riding (Middlesborough) Battalion. 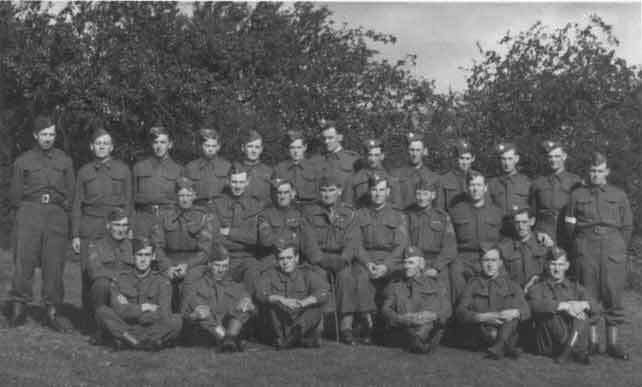 It lists those Battalion Home Guard officers present: Lt.-Col. Crawford; Majors R. Widdicombe, A. Watson, H. Banniser, R. Whiteley, G. Ward; Captains W. Noon, E. Grundy, J.O. Wood, B. Abbey, W. Peat, J. Hetherton, S.C. Webb, B. Dawson, B.H. Bonning, J. Dunston; and Lieutenants W. Young, Church, S. Rowe, J. Pollard. Read the report in its expanded version here and also view a photograph of the event. 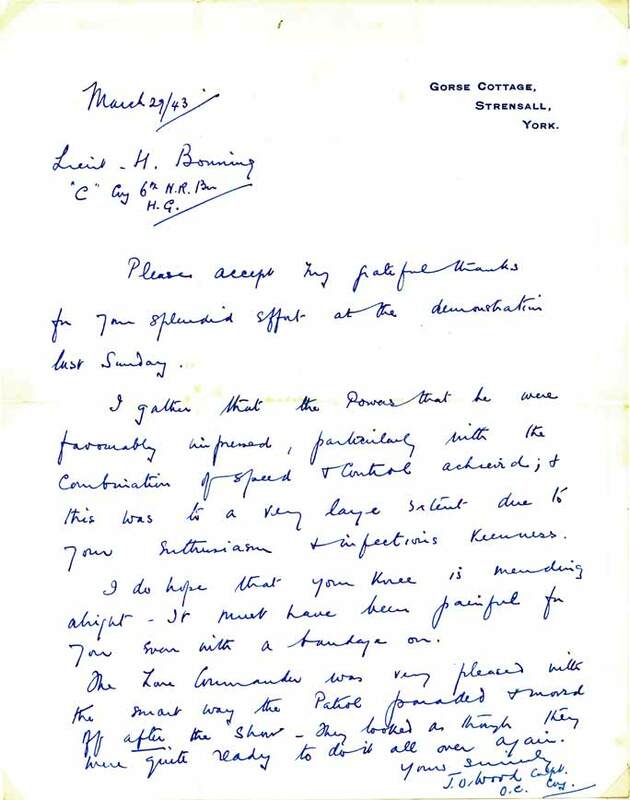 Harry Bonning obviously played a major role in the training and demonstration events. This contribution was acknowledged by his Company Commanding Officer, Capt. J. O. 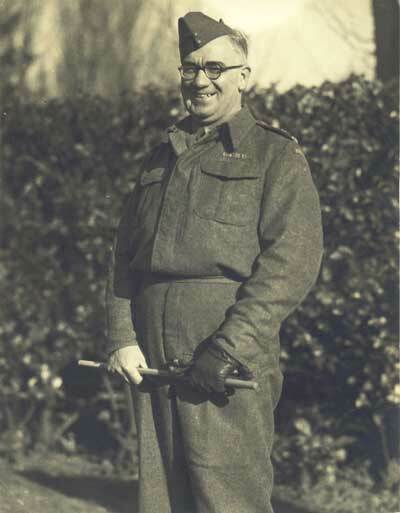 Wood, following an earlier one held in March 1943. This letter indicates too that such activities were not wholly without cost to men who were past the first flush of youth. 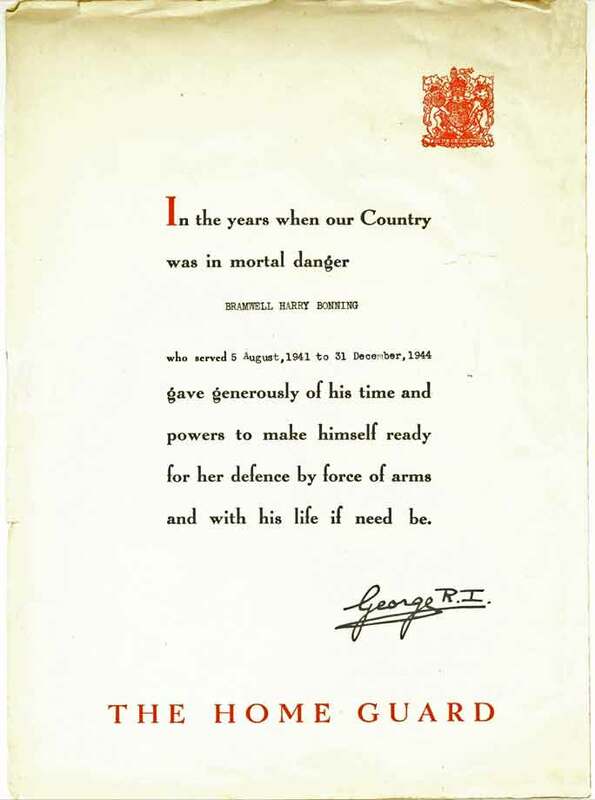 This letter and, much later, the Certificate received by him from his Sovereign, H. M. King George VIth are two minor acknowledgements of over three years of devoted and entirely voluntary service. Grateful acknowledgement is made to HB, son of Captain Bonning, who has made these documents and images available to staffshomeguard and generously permitted their publication on this page; and also to members of the excellent Birmingham History Forum through whose efforts and knowledge the exact location of the Birmingham image was identified and who are the source of other information and images.